Developed in England to hunt hare in packs, the first pack of Harriers was established in 1260. There are many stories that relate the ancient origins of the Harrier, but it is generally believed today that the breed is simply a smaller version of the English Foxhound, having been bred down from the larger breed through selective breeding. They have been used in America for hunting since Colonial times. 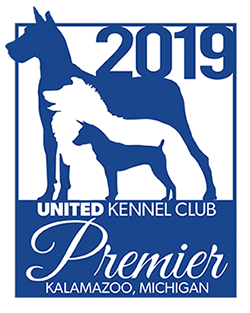 The Harrier was recognized by the United Kennel Club in 1949. The Harrier is a smaller version of the English Foxhound. It is 19 to 21 inches at the shoulders. It is solidly built and should have as much bone and substance as possible without being coarse or heavy. 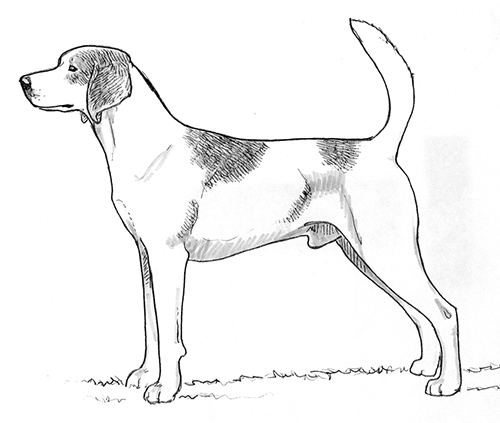 Any good hound color is acceptable and the breed has a natural ear and tail. A hound pack animal, therefore aggressiveness towards other dogs is not tolerated. Temperament is outgoing and friendly. Head should be of medium size, with a good bold forehead. Its size should be in proportion to the dog. The same length from the stop to occiput as the stop to the nose. Quite large and rather broad, with no prominence of occiput, and a slight stop. Approximately the same length as the skull. Never square, instead tapering towards the nose but not snipy. The nasal bridge is straight. The lips cover the lower jaw. A full complement of strong, white teeth meet in a scissors or a level bite. Well open and dark in color with a frank, lively and intelligent expression. Lighter eye color in the lighter colored dogs is acceptable. V-shaped, quite short, almost flat and set on rather high. Long, strong, well attached and slightly arched. The shoulders are long, oblique and muscular without being loaded or heavy. Long, straight and parallel. The elbows are set away from the ribs. The legs have the slightest tendency to knuckle over, without any exaggeration. There is strong bone that continues down to the foot. In proportion, the body is slightly longer than tall. The chest is deep, with well sprung ribs that run well back. The topline is level and the back is straight and muscular. The loin is strong and slightly arched. There is little tuck up. Angulation in balance with the front assembly, so that the rear drive is in harmony with the front reach. Well-developed muscles provide strength for long hours of work. Endurance is more important than pure speed. The stifles are only moderately angulated to provide the endurance. The hocks are close to the ground. The rear pasterns are vertical. Feet point straight ahead, are round and catlike; with toes set close together, and thick, well-developed pads. Short, dense, hard and glossy. Coat texture is finer on the ears than on the body. There is a brush of hair on the underside of the tail. There is perfect coordination between the front and rear legs. Drive and reach are consistent with the desired moderate angulation. Action is straight coming and going. Side gait is more important than clean coming and going. The side gait should be smooth, efficient and ground covering.